The national sport of Philippines, this martial art form is called Eskrima in the central islands, Arnis in the northern islands and Kali in the southern islands of Philippines. Kali is the name used for eskrima in USA and Europe. It is also known as FMA - Filipino Martial Arts. Eskrima is a weapon based martial art form that lays emphasis on stick and sword fighting. Unlike other martial arts, sticks are used from the start of training as it is believed that when a student improves speed, coordination and timing with a stick, he would excel when fighting without the stick. Practitioners of this art form develop dexterity to fight with or without weapons simultaneously. 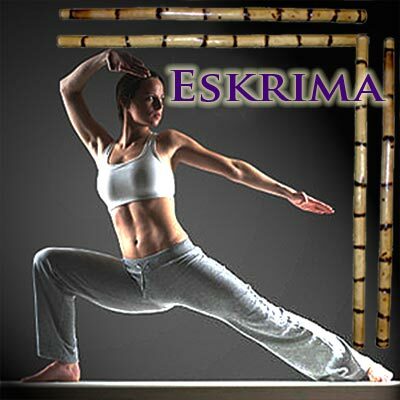 Eskrima originates from the Spanish word esgrima which means fencing. Quick stealthy moves characterize escrima steps. Intense powerful strikes with economy of movement are the basics of eskrima practice. In addition to being a self-defense art, eskrima offers a healthy workout for toned upper body and improved aerobic capacity. Your elbows, hands and forearms will benefit from the movements making them flexible and better coordinated. No special uniform is needed for an escrima workout. Students are taught indoors. Students of eskrima begin using weapons from the start of their practice, in the advanced level they fight empty handed. Weapon is considered to be an extension of empty hands as the same angle of footwork is employed with or without a weapon. The common weapons used in eskrima are stick and knife. The techniques involved in eskrima while using the stick, knife and hand are the same and are known as motion grouping. Most systems of eskrima begin training with two weapons; they could be a pair of stick or a combination of wooden stick and knife. A student trains to become ambidextrous, meaning he can use his/her limbs independently. The three main aspects to eskrima learning are fluidity, rhythm and timing. The flowing skills are highly important. Yantok: is a stick used in eskrima training made from the rattan vine; commonly found in Philippines. This wood though lightweight is hard and durable; it can also be hardened using fire. It does not splinter like other types of wood and so is considered the best tool for martial training. All these qualities make this stick apt for defending against blades. Eskrima sticks are available in different sizes depending on the eskrima system and the range for which training is being offered. Common lengths range from 6" to 96" and the range varies from 24" to 36". Baraw: means a knife or dagger. There are many types of edged weapons like Balisong, a fan or butterfly knife and Barang, flat headed blade etc. Impact weapons: Impact weapons include long stick, wooden dagger, shield, long stick, medium size stick etc. One for one where a strike is followed by block from opponent and vice-versa. Here, hand against hand and hand against weapon variations are used. Extreme advanced forms include counter for counter movements. Extend arm and hold stick pointing toward the ceiling. Twist wrist in a quick counterclockwise motion so that the side of the stick strikes partner's weapon. After hitting, twist wrist in the opposite direction so that stick strikes the other side of the partner's stick. These movements are called abanico or fan techniques in escrima. Abanico techniques can be used to block an attack or strike opponents. This quick escrima move is aimed at the opponent but correct wielding of the weapon helps build self confidence. Redondo is performed by striking the target in a circular fashion. Stick should be vertically whipped towards the opponent and should be taken back to the original position. Twirling helps in distracting and disorienting the opponent. Coordination can be improved by simultaneously twirling the sticks in opposite directions. Speed, timing, accuracy and coordination are of the essence. Sticks have to be gripped near the bottom. Sticks have to be held at the sides, the top ends should point towards the floor. Twirl the stick by using the wrists, sticks have to be twirled upward while they point toward the ceiling. Twirl again so the sticks return to their original positions. Slow and steady pace jogging, ensure that you handle your breath perfectly as eskrima involves breath control. Stretch the body using dynamic stretches, remember to stretch major parts of the body. You can warm up with sticks; this includes twirling and twisting the stick. These exercises work on the shoulders, elbows, wrists, etc. Continue with breathing exercises to cool down the muscles. First Published Date: 17 Oct 2012 Last modified Date: April 23 2019 This page may have been updated recently as new information is available or the content may have been edited for better readability.